Dr. Erin Chambers is a Director in the Scientific Operations group at Waters Corporation. She recently served as a judge for the Bioanalysis Zone New Investigator Award. 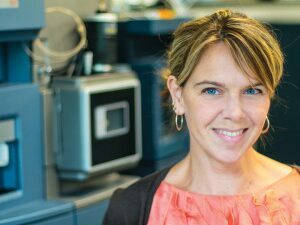 I sat down with Erin to gauge her impressions of that experience and the award’s importance to the bioanalysis industry. What was it like to be part of the judging panel for Bioanalysis Zone’s New Investigator Award? What an eye-opening and humbling experience. The depth and sophistication that these young investigators have this early in their careers is impressive. It was fascinating to learn their unique stories and gain insight into why they entered the field of bioanalysis. Some want to cure disease after losing a loved one to cancer; others have a more prosaic approach where it’s about solving the analytical challenge and making a scientific impact. Regardless, they all have an intense passion, which was reflected in the quality of their work and the complexity of the research. And it was reassuring to see the great amount of diversity represented in the slate of nominees: men, women, a range of backgrounds and ethnicities. Diversity brings a certain richness of experience and knowledge that you can’t get by traditional education alone. What does the award recognize and why is it important? The award recognizes exceptional bioanalytical research by new and young investigators. Distinctions like the New Investigator Award encourage those just kicking off their career in bioanalysis to solve meaningful and complex problems. It’s critical to keep this caliber of scientists engaged and demonstrate that the industry sees and appreciates their work. The award gives nominees and their research visibility to thousands of other scientists as well as an opportunity for the winner to present his or her work at the EBF conference. Of all the submissions you reviewed, did you uncover any common themes? We received 25 high-quality nominations, eclipsing last year’s total of six. Several focused on biomarkers and biomedical research. Twenty-five years ago we didn’t talk much about biomarkers. Now, it’s a major area of focus. This reflects a greater industry trend toward translational and precision medicine. We also saw work being carried out which applied a few seemingly esoteric technologies not frequently associated with bioanalysis. I think this reflects the high level of ingenuity inherent in the applicants as they apply traditional tools in new spaces to solve complex problems. I was really impressed by the highly advanced level of technical competence and the penchant for innovation by all the nominees. We saw novel ways of normalizing endogenous analytes to allow for measurement of biomarkers. There were novel applications of conventional technologies like Electrochemiluminescence (ECL) and synchrotron infra-red imaging, as well as new sample prep methods like automated alveolar breath sampling using microextraction. What did you learn about the judging process? The process was an iterative one. The background questions (which were not used in the final weighting) were important in forming some initial impressions, and in starting to “get to know” the candidates as individuals. At this point, a few candidates started to stand out. Once I began the next step of more thoroughly examining their research and the responses to the rest of the questions, I gained a much more complete picture of them as scientists contributing to a broader body of research. I was able to see a multi-dimensional portrait of their passions and interests, which brought additional candidates up to the top of the list. Honestly, there were so many great nominees that it became very difficult to distinguish between those top 6 candidates. After submitting our recommendations, we got to see the top candidates resulting from the cumulative review from all judges – it was gratifying to see that those who emerged were the same that we had identified. You can also tell by the fact there are six to choose from, not just two or three, that distinguishing between these top candidates is going to be very difficult. The voters have a big challenge! Why is it important that Waters participates in efforts like these? We are a company that, above all, values the quality of science. To be true to our reputation, we should be supporting others who share similar ideals. We have excellent scientists who work at Waters. It’s our responsibility to support others and their research, whose work we care about and believe in. Waters plays an important role in advancing science. We primarily do this through technological innovation, but we also champion the scientists – new and experienced – who are moving scientific research forward. Anything else you would like to say in closing? I’m really proud to be part of the New Investigator Award. The industry needs to do more of this. We need to continue to recognize people early in their career, while shining a spotlight on great science no matter where people are in their career: early, mid, or late. There’s a lot of other great work out there that’s not getting recognized in the way it can or should. And, please vote. You can access all the nominee profiles on Bioanalysis Zone. Voting ends August 19.